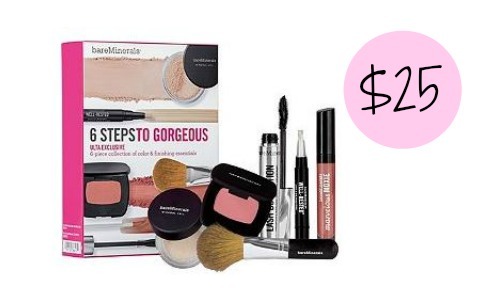 Home > Household Deals > Ulta Deal: 6-Piece BareMinerals Kit for $25, Today Only! Ulta Deal: 6-Piece BareMinerals Kit for $25, Today Only! Need some new makeup? Today only, Ulta is offering the BareMinerals 6 Steps to Gorgeous kit for $25 (reg. $39 and a $106 value)! The kit has six products including mineral veil finishing powder, face & eye brightener, blush, mascara, lipgloss, and an application brush. BareMinerals really is one of my favorite makeups. This deal is valid through today only. Shipping is FREE with $50 or more. Did you know Ulta takes manufacturer coupons? You can stack them with store coupons, too!